A fedora of Squishee• with self picot edge brim and banded with classic gross-grain. Elasticized inner band fits most. Signature logo rivet is discretely placed at the back. 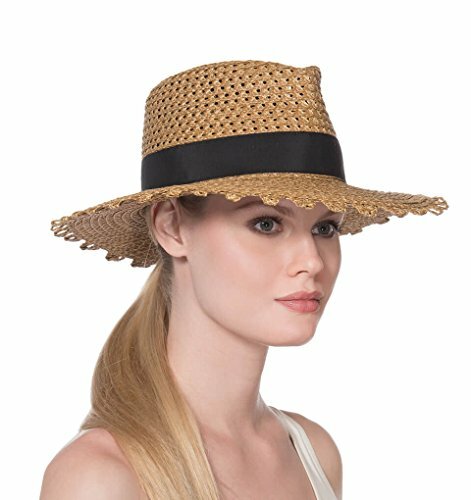 This vented straw style has a double faced brim which is 50+UPF protective. Lightweight and packable. Blocks 95% UVA/UVB rays. Look your best while enjoying the sun! Independent testing in accordance with AATCC (American Association of Textile Chemists and Colorists) test methods have determined this product's effectiveness for blocking ultraviolet radiation as well as UVA/UVB radiation. This product was awarded the highest rating of 50+ UPF by independent testing. To learn more about AATCC testing, go to www.aatcc.org. The crown's open weave does not provide sun protection to the top of the head. A fedora of Squishee• with self picot edge brim and banded with classic gross-grain.